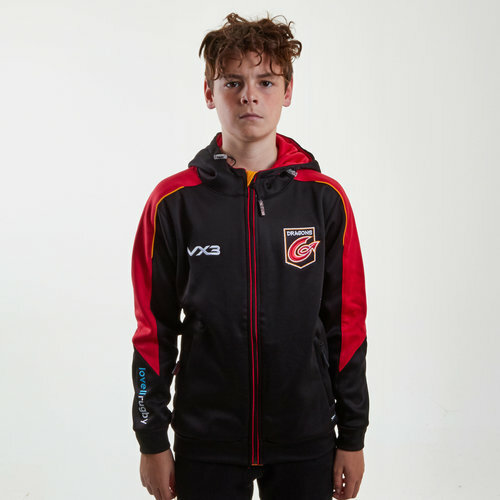 Ready to pull on to stay warm in the stands at the Rodney Parade or at training, make sure you show everyone who you're supporting with this VX-3 Dragons 18/19 Kids Pro Full Zip Hooded Sweat. Designed with the Dragons and VX-3 logos proudly embroidered on the chest, training wear sponsors Lovell Rugby take place embroidered on the right sleeve of the hoodie. In smart black and red colours with gold trim, a full zip and drawstrings on the hood allow you to wear this hoodie how you like. Proudly pull on this VX-3 Dragons Pro Full Zip Hooded Sweat anywhere.